Growing up, my dad was a police officer. Maybe that’s the reason I’ve always wanted to stick to the rules. I’m a people-pleaser through and through. I love it when I get kudos for a job well done. I hate it when I feel I’ve disappointed someone. Too often I find myself treating God as if He too were a police officer–hanging around, waiting to catch me crossing the line. Every morning, as I journal my prayers, I write out my confessions. Then I end with prayers seeking God’s strength to help me be good. The part that stopped me in my tracks was “Many . 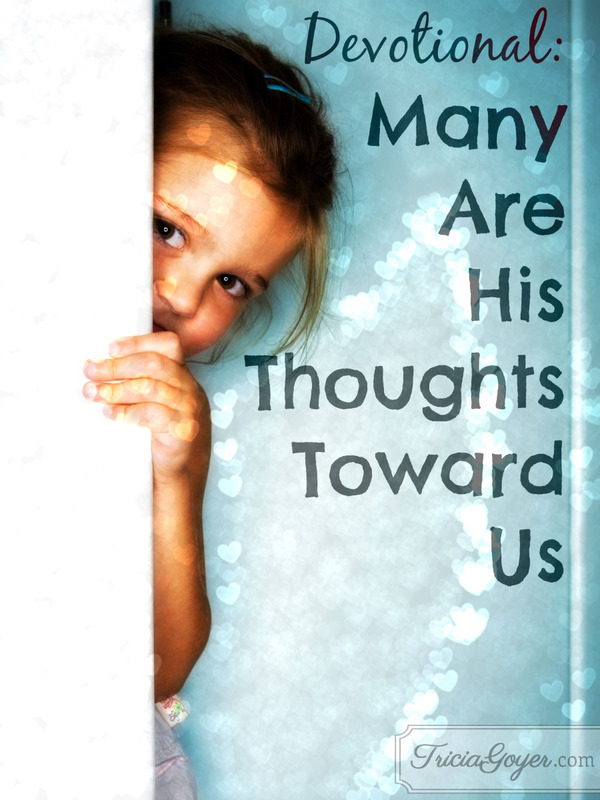 . . are Your thoughts toward us.” So I paused, and pondered this for a while. I pictured God thinking about us a lot. God thinking about me. Loving me. Caring for me. It brought tears to my eyes. All around us we have people telling us we need to be good, to do the right thing, to follow the right path, to care for others more than ourselves. That is all fine and good, but sometimes we need to just be okay with the fact that God loves us–at this moment, how we are. He is thinking about me TONS. He is thinking about you. We need to think of the Daddy who welcomes us with open arms. God, grant me the patience toward myself to simply know that You love me, at this moment, just how I am. Let your goodness and your attention toward me sink into the depths of my being. You are not a police officer keeping distance, You are my Father welcoming me with open arms. This is such a good reminder, and I needed it today! I recently listened to part of a sermon by Brennan Manning and he talked a lot about how understanding God as our Abba is so life-changing. I’ve been meditating on that for a couple of weeks now. Thanks so much for being a part of Booknificent Thursday this week! So glad that it was a blessing to you!